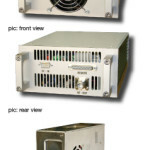 The main applications for both versions of this MHz generator mentioned above are plasma activation, cleaning, etching, semiconductor- (front-end), semiconductor- (back-end) applications, and plasma polymerization. Impedance matching, which can be done manually or automatically, is a necessary component of these RF-generators and is always included. Manual matching involves setting the forward and reserve power settings before the start of each process and manually regulating these settings periodically through out the set plasma process time. With the auto-matching option the capacitors are set automatically and then adjusted and corrected automatically for changes. The following options can also be included: display of the forward and reverse power, safety switches (automatic shutdown) on door and vacuum safety switches, PC-Interface, and quarz stabilized frequency in accordance with DIN EN 55011. 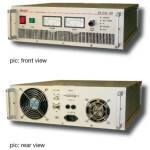 Automatic or manual adjustment of a 13.56 MHz High Frequency (HF) generator to low-pressure plasma.